If you teach your children at home, or tutor them after school, then this might be useful advise for you. I know how frustrating tutoring can be. I’ve exchanged stories with a couple of mom friends who have decided to leave that job to the professional tutors- for fear of straining their relationship with their children. I’m not proud to say that I’ve turned into monster mom myself while teaching my kids. Learning how to make it easier for both me and my girls has encouraged me to find out more about how people learn. We all have different learning styles. Learning styles are basically a preferred way of learning. Whether you like to read out loud or sing it out, some learn with pictures and some learn with words. There are different ways each of us receive and remember information. I’ve never had difficulty teaching my eldest daughter Catie. She would come home, go to the study and finish her homework without much prompting. When final exams rolled around, I would pick up her book and verbally quiz her to see if she was ready. Everything was done in less than half an hour and this was pretty much how we did things. My second grader on the other hand, started having difficulty in subjects instructed in our native tongue. It was our brilliant idea to converse with them in English when they were younger thinking they would naturally learn Tagalog from everyone else. Right? Wrong. Everyone seemed to have the same idea, and all the kids in the neighborhood and in school were speaking to them in English. No one seemed to be speaking in Tagalog, not even the caretakers. 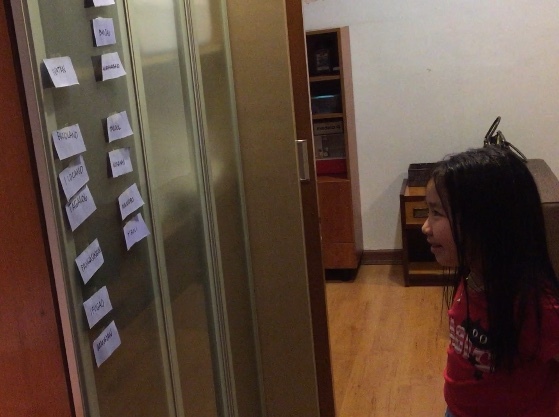 While my eldest had no trouble learning Filipino and Araling Panlipunan ( Social Studies), her sister was resistant. She would complain about it being too hard. She would suddenly be hungry, or thirsty or tired. She would sing and dance and roll around on the floor oblivious to what she needed to accomplish. I’d be so frustrated helping her with her homework. I would repeatedly ask her to listen carefully, sit still and keep her focus on me as I quizzed her. My questions would often be met with a wide-eyed stare, followed by her rolling her eyes at the ceiling. I couldn’t seem to hold her attention for very long. One day, I tried something new and decided to use a game to help her learn. I put the key words she had to memorize on sticky notes and put them up on the wall. I taught her how to use mnemonics in order to remember the key words better. It helped keep her focus as I rattled off the words to her. I thought we were doing great. This was supposed to work. Unfortunately, I was disappointed to know that she retained very little of what she studied when the exam results came in. She only got one question right. Sigh. One weekend, my husband volunteered to help review them for upcoming quizzes, and that led to a very interesting discovery. He found it very easy to engage my younger daughter. He pulled out a whiteboard marker and asked her to create a memory map of all the things she was supposed to review on our glass table. He asked her to create boxes and write down the key words of everything she needed to understand. She worked on this non-stop for the next hour without any supervision, stopping occasionally only to clarify certain words she didn’t understand. I was amazed at the self-discipline she displayed. There was none of the whining and rolling around on the floor, as I previously experienced, only a very still 6-year old diligently making a reviewer. I was amazed at this development. When it was my eldest daughter’s turn to be reviewed, my husband tried to implement the same exercise with her unsuccessfully. I was surprised to see that he was starting to get impatient with her, repeatedly asking her to sit and focus. He was experiencing the same frustration with her as I was with my younger daughter. Catie kept stepping in and out of the room, distracted with other things. It totally blew my mind. I was amused and curious at the same time. I let my husband go at it for another 15 minutes before he finally gave up and pointed her back to me. Children learn in different ways. My eldest daughter is very much like me, who captures things by having someone explain it to her. 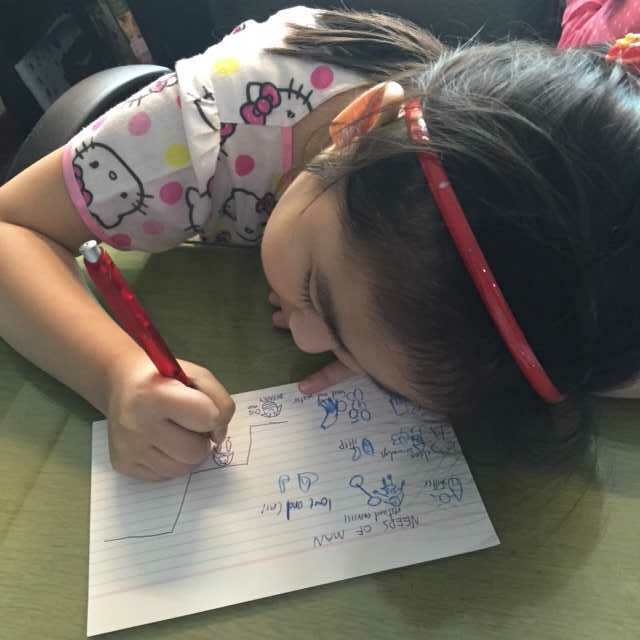 Classroom type lectures work for her and she is able to easily remember the lessons well. My second daughter is more like my husband who likes using a lot of visuals when she studies. As I explain to her, I noticed that she would write things down to help her remember. It occurred to me that whenever my husband and I attended learning sessions together, he would also draw diagrams to help him organize his thoughts. There are 3 known basic learning styles. Visual, Auditory & Kinesthetic. I’ve seen some studies that have expanded it up to 7, but most still fall under these three categories. Learners use all three functions but everyone is different. A person can be more dominant in one or two or use a combination of all three. Learning preferences may also be different depending on the task involved. There are two types of visual learners. Linguistic and Spatial. 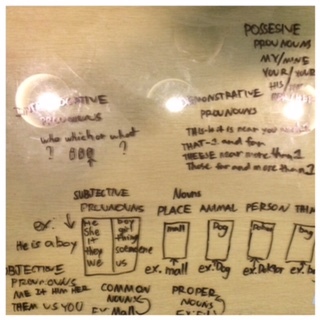 Visual Linguistic learners work well with lectures and writing down notes, they learn by reading and writing. They see words before pictures, so re-writing their notes as a review can help them remember. Visual Spatial learners on the other hand, have well-developed imaginations and learn better with charts and pictures. They see pictures before they pay attention to words.They can also be very good with direction and seldom get lost in new surroundings. You can help visual learners by providing lots of visual material like slide shows and hand outs. Demonstrate with diagrams and write down words as you explain. Auditory learners learn by hearing. They learn from participating in discussions, and talking things through. They enjoy opportunities to present dramatically and can include the use of music. Auditory learners move their lips and read out loud. The best way to teach auditory learners is by questioning or quizzing them verbally. One of the ways you can help auditory learners is to tell them what they’re going to learn, teach them, and then tell them what they’ve learned. You can ask them to discuss and recite the information out loud and verbalize goals and assignments. Kinesthetic Learners like to do things and remembers best by experience. There are 2 sub-channels of kinesthetic learners as well. Tactile (touch) and kinesthetic (movement). Kinesthetic learners lose concentration when there is no stimulation or movement. They prefer their learning to be connected with reality. This can be done through demonstrations, exhibits, case studies and concrete applications. Movies and videos are more kinesthetic than visual, because it helps them connect to a simulated “real” experience. Kinesthetic learners can remember how to do things after they’ve done them once (motor memory). They also have good motor coordination. You can help them learn by allowing them to pace, walk around or rock in a chair as they memorize. They might not study well in a desk, and might work better in a lounge chair or bean bag or on their belly. In a traditional school setting, it would be best if they were allowed to use highlighters and colored pens to allow them to draw and take notes for the sake of moving their hands. Explain by using plenty of examples. Kinesthetic learners may also need frequent breaks of 3-5 minutes in between 15-25 minutes of learning. There are 3 parts of the learning style. How we receive information, how we process information and finally, the environment for learning. The environment considers things like your child’s preference to study in the morning or at night? With music or with complete silence? In groups or by themselves? Knowing the different learning preferences allows us the flexibility to compensate for their strengths and weaknesses. Knowing that everyone just learns differently makes us more conscious of how to make them learn better. Further research has been unable to prove that using one learning style provides the best means for learning a task or subject. Having a multi-sensory approach works better since we use all 5 senses to interact with the world. Engaging as many senses as we can when learning allows us to remember things better. Here’s an example. It would be easier for you to remember something you’ve seen, felt, smelled and tasted, over something you’ve just seen. Knowing that children have different learning preferences allows us to create a better learning environment for different types of learners. Back when I was in school, I think kinesthetic learners were challenged the most. Their need for movement was often judged as a disinterest to learn. Knowing that kids have different learning styles can mean that a student doesn’t need to get reprimanded for tapping his foot, or doodling during a lecture, because this is simply how he or she learns. Observe how your children learn and help them by figuring out what kind of learner they might be. 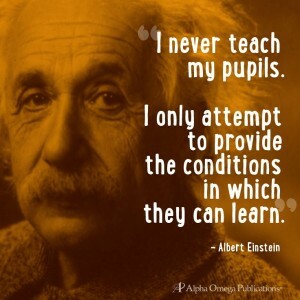 The most able learners are those who can adapt their ability to learn. The objective is not to change the way they are taught, but to help our children learn better and adapt. Teaching them how to develop learning strategies despite the teacher’s teaching style can be more beneficial in the long run. Family Stories : On birthdays and what matters most.